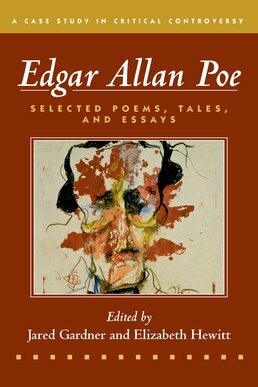 Introducing you to critical conflict in literary studies, Edgar Allen Poe combines selections from the author's fiction, poetry, and nonfiction with critical essays focused on three major areas of controversy--aesthetics and the literary marketplace, race, as well as gender and sexuality. Distinct editorial content complements the pieces direct from Poe, creating a platform not only to discuss Poe's life and the controversy around it, but also to engage in cultural debates about literature itself. THE CONTROVERSY OVER AESTHETICS AND THE LITERARY MARKETPLACE; OR, IS POE A LITERARY GENIUS OR A POP CULTURE HACK? THE CONTROVERSY OVER RACE; OR, WHAT DID POE HAVE TO SAY ABOUT AFRICAN AMERICANS AND SLAVERY? THE CONTROVERSY OVER GENDER AND SEXUALITY; OR, WHY IS POE SO OBSESSED WITH DEAD WOMEN? Edgar Allan Poe (January 19, 1809 – October 7, 1849) was an American author and poet; his short stories include "The Fall of the House of Usher," "The Murders in the Rue Morgue," "The Pit and the Pendulum," and "The Tell-Tale Heart."